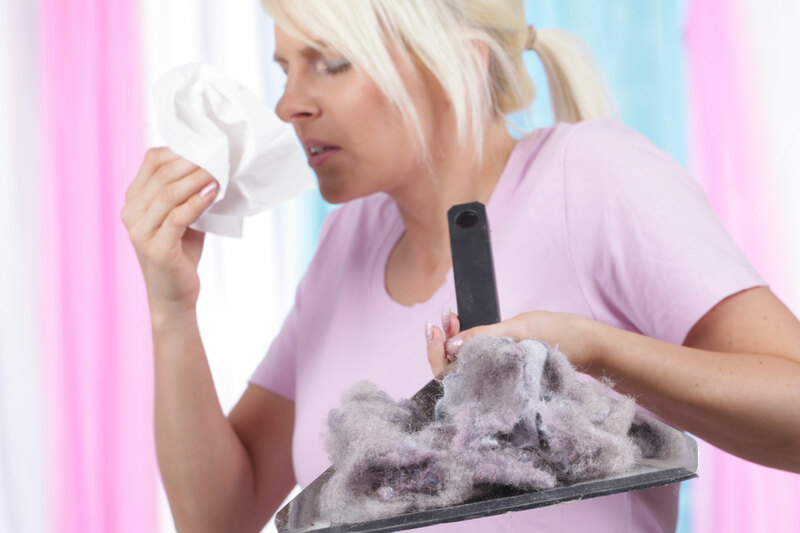 Allamanda > Service > What Is Allergy Cleaning? The Responsible Care System is an all new allergy cleaning system that works to eliminate dust mites from the home. In fact, the goal of the program is to reduce the level of dust mite allergens in the home by at least 90%. This anti-allergen treatment and cleaning program is safe, easy, affordable and professional and can bring you relief from allergies right away. Many people believe that if they keep their home clean, it will eliminate dust mites; however, this is just not enough. As long as there are pets in the home, dust mites will be in residence too. This is why many doctors recommend patients with allergies get rid of pets, but of course, most loving pet owners are just not able to do this. Luckily, with the Responsible Care System, this step is not necessary. With our unique allergy cleaning process, we don’t stop at cleaning your home. We also apply our proprietary Allergy Relief Treatment to all soft surfaces, such as bedding, carpets, rugs, upholstered furnishings, mattresses and more. Is The Allergy Relief Treatment Safe? The Allergy Relief Treatment is a perfectly safe finishing touch to the allergy cleaning process. Our natural, proprietary formula works to change the shape of the proteins in the allergens. This small change causes your immune system not to recognise them as allergens. For this reason, you do not suffer an allergic reaction. Our formula has been proven safe for use around people with severe chemical sensitivities and allergies. Allamanda Allergy Relief Treatment is scent-free and completely safe for your entire family, your pets and the environment. It is made up of entirely biodegradable, hypo-allergenic, natural ingredients derived from vegetable seeds and renewable fruits. It contains no benzyl benzoate, phosphates, toxins, pesticides, perfumes, dyes or volatile organic compounds (VOCs). This crowning step to the allergy cleaning process is completely hazard-free. Allergy Cleaning Comes With A Guarantee? YES! When the Responsible Care System of anti-allergen cleaning and treatment is used to service the mattress and carpeting in the bedroom of allergy sufferers, it is guaranteed to provide a noticeable improvement in allergy symptoms within three days or we will refund the portion of their charges for application of Allergy Relief Treatment only. Will I Really Feel Relief In Three Days? You should actually feel a great deal of relief from your allergy symptoms right away. You will notice the most dramatic changes within the first three days, but you will very surely enjoy a better night’s rest the very first night you sleep on a mattress that has been treated with our allergy cleaning system. Why suffer a moment longer? Allergic illnesses develop when the body is overexposed to certain allergens. In effect, the body programs itself to consider these normally harmless substances as illness causing intruders to be defended against. The way the immune system guards the body is by producing what are known As IgE antibodies. Allergens are proteins that have unique shapes that identify them as allergens to the antibodies in the immune system. The allergen is like a lock and the antibody is like a key that fits only that lock. The Body’s IgE antibodies are constantly on the lookout for the presence of the allergen they were created in response to, sort of like keys floating around the immune system looking for the locks they were created to fit. When these antibody “keys” find a repetitive Pattern of allergen “locks”, the body defends against these perceived intruders by the antibodies binding with the allergen, much like inserting a key into a Lock. This sets off a chemical reaction designed to protect the body from infection. This rush of Chemicals into the body is what is experienced as an allergic reaction or asthma attack. Allergy Relief Treatment is a very safe, simple and highly effective way of changing this shape of allergen proteins, making them unrecognizable to the body! Nothing about the allergen is changed except its shape. So, when this shape is changed, there is no repetitive pattern that identifies the material as an allergen and therefore, there is no allergic reaction! Another way of looking at it is that Allergy Relief Treatment disassembles or takes apart the allergen locks. In a very real way, the lock is still there. Only now it is in the form of its component parts rather than an assembled lock. Because allergens no longer appear as a “lock” to the body, the antibody “key” does not bind with them and there is no allergic reaction!